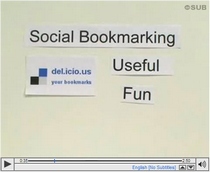 Social bookmarking: what is it really? It's all over the web already, though it came out just a few hours ago, this new great educational video about what social bookmarking really is. After RSS, Wikis and Social Networking, Lee and Sachi are doing it again. With their unique video style, made up of simple cut-outs and printed messages that appear in front of the camera accompanied by a simple, easy and no-technical-jargon voice-over, they are setting a new standard in what quality user-generated video content can be. With production costs nearing absolute zero, but with simple, creative ideas, there exist infinite possibilities to re-invent and re-define what quality video is all about. And Lee and Sachi are doing just that. If you are an educator, a technology evangelist or a computer club associate, this is the type of material that you want to treasure and share the most, as it is free, highly distributable and viewable on just about any kind of computer. Since I can only do so little to further express my sincere appreciation for this type of work, I have once again decided to honour the CommonCraft precious work by republishing their video (with captions) and its full text transcript here below while providing in the coming hours full international versions in Italian, Spanish and Portuguese. Did you know that there are over 15 billion web pages? To make sense of it all, we need to pluck out the best pages and save them for later. We could bookmark or add to favorites in our web browser. Nah, it quickly becomes messy. Plus, these bookmarks are tied to only one computer. This is the old way. There's a new way that doesn't use a browser. It uses a website. 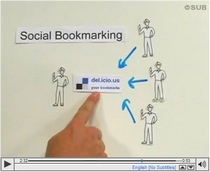 This is called a social bookmarking site, and the one we'll use today is called Delicious. It makes bookmarking more useful and fun. c) Why this kind of bookmarking is social. First, go to delicious to sign up for a free account. While you're signing up, you'll see an easy to add a couple of buttons to your browser. These are important. The Tag button is how you'll add new bookmarks to the website. On any website, you can click Tag to save that site as a delicious bookmark. Easy! Consider this example: you are a teacher who often uses the web to find math lessons for 8th graders. You're overwhelmed by all the sites. There are just too many to remember. Using delicious, remembering sites is as easy as tagging them. Here's one. Oh nice, perfect. Here's what happens when you tag a site: a new window opens and asks for more information. You can add keywords or tags that describe the site. These will help you find bookmarks later. You might tag this site, algebra, bestof, tutorial, math, and homework, then click save to save it on the delicious website. When you save a page like this, two things happen. First, the site is saved with all your other bookmarks on delicious. Second, the tags are saved in a list of all your tags. You just repeat this process for every site you want to save. This is bookmarking. Let's fast forward two months to make our second point: Why tags are so important. Let's say you now have a hundred bookmarked sites. Chaos, right? Well, since your added tags, you have a way to sort the bookmarks by the tags you assigned. To find all your sites about algebra, you click the algebra tag, and voilà, one hundred becomes three. All your bookmarks are now more findable thanks to tags. But that's only part of the fun. Now, let's look at the social part of bookmarking to make our third point. Think about your fellow teachers. Couldn't they benefit from seeing your bookmarks? Well, they can. Delicious bookmarks are public. This means your friends and peers can see your bookmarks and use your tags just like you. That's why this is called social bookmarking. Your bookmarks can benefit other people. Think about it this way. You start bookmarking algebra sites, and your peers can see the interesting sites you find. Then, they start bookmarking too. Within a few weeks, a group of teachers are all bookmarking their favorite math websites, and because they're all public, everyone discovers new and relevant material. Together you create a network that produces a steady stream of interesting and useful websites, all organized by tags on the delicious website. The lesson is that social bookmarking sites take a world of chaos and make it orderly. Remember there are three steps to get started. 1) First go to delicious to sign up and add the buttons to your browser. 2) Second, start bookmarking sites with tags. 3) And third, be social. Notice how useful and fun other people's bookmarks can be. Learn, explore and discover what new media social technologies are all about by checking out the CommonCraft Show. Lee Lefever and Sachi were here in Rome just about a year ago. If you don't know this great pair of guys you can discover a bit more about them by watching these souvenir video they shot as me and my brother Giovanni took them for a motorbike tour of the city.